Monday night should have marked a full-scale thrash invasion of the Phoenix Concert Theatre, where veteran titans Testament were headlining a tour with Overkill, Flotsam and Jetsam, and Australia's 4 Arm. Then a few days before the tour hit Toronto, Overkill's Bobby "Blitz" Ellsworth developed pneumonia, first causing the band to cancel some shows and, eventually, pull out of the tour altogether to give the singer time to recuperate. A little of the buzz sizzled out with Overkill's withdrawal. That is, until the bands started to play. The least known and youngest band on the bill, 4 Arm were still reassuringly solid — straightforward thrash, poundingly loud and heavy. Gracious in their brusque way, they thanked Toronto "for having us in your house" and offered the crowd something fast ("Submission for Liberty") by way of return. They used their brief time on the stage to great effect, winding up with the classically titled "Spent and Bled." With Overkill gone, Arizona's Flotsam and Jetsam performed for a full hour, mixing a little of the old with the brand new. Their set started slow and ominous, with a dark stage and a faint hint of cymbals, then deep piano tones as the band members stepped out and began adding their own layers to the mix. Frontman Eric A.K. pumped the band's newest album, last year's Ugly Noise, and joked about the challenges of the Can-Am border crossing, but for the most part, the band drove from one song straight into the next. A.K. 's vocals were strong, and while the guitarists traded off solos he played steady air guitar and air drums or banged his head — all energy and intensity from the first moment to the last. Tracks like "Swatting at Flies" and "Hard on You" were highlights, but the band were in top form throughout. As impressive as the opening acts had been, it was clear the fans were really there for Testament, as the numbers and excitement peaked with the band's arrival on stage. The headliner's set was a complete sensory onslaught — lights, volume, speed, brutality. Brief ballad-esque intros and interludes only emphasized the heaviness. With bassist Greg Christian hanging back and Gene Hoglan obscured by his drums, guitarists Eric Peterson and Alex Skolnick grabbed much of the spotlight — Skolnick making great faces with each solo. 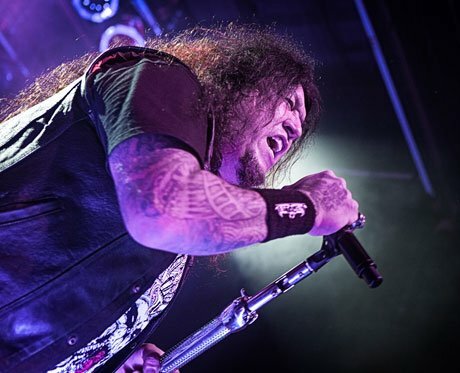 But it was vocalist Chuck Billy who, as usual, stole the show, snarling and growling impressively and playing near-constant air guitar on his phallic half-mic-stand. As a fan treat, the band brought out two "VIPs" to join in on the chorus of "Into the Pit," but otherwise the show was pure Testament, from classics "Practice What You Preach" and "Trial by Fire" to newer tracks like opener "Rise Up." The only disappointment was the length of their set — one hour and no encore — so that the band were saying good night while the audience was still raring to go.